Weekly History for our family for this week. As always, you can find any date on the Dates & Anniversaries page. 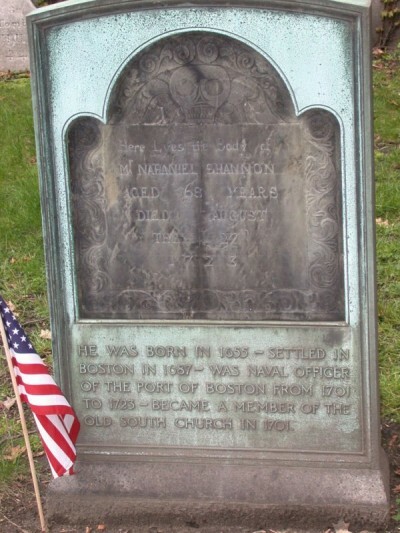 Nathaniel Shannon's Headstone in Boston. Click for larger. 1714 – Married – Nathaniel SHANNON & Abigail VAUGHAN – Nathaniel and Abigail are my wife’s 8th-great-grandparents on her mother’s side. Nathaniel was born in Boston, Suffolk Co., Massachusetts in 1689. Abigail was born in Portsmouth, Rockingham Co., New Hampshire in 1683. They were married at Ipswitch, Essex Co., Massachusetts. Nathaniel passed away in 1723 in the West Indies. It is not known why he was there exactly, maybe on business. Abigail lived much longer and passed away in 1762. 1869 – Born – Felix BANNACH – Felix is my wife’s great-great-grandfather on her mother’s side. 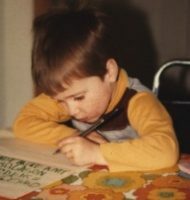 He was born in German Poland, in what is now probably Poland. He married Mary WOJACK in 1894 in Portage Co., Wisconsin. Felix passed away on 31 Oct 1943 in Waukegan, Lake Co., Illinois. 1723 – Died – Nathaniel SHANNON – Nathaniel is my wife’s 9th-great-grandfather on her mother’s side. He is the father of the Nathaniel mentioned above. He was born around 1655 in Londonderry, Ulster County, Ireland. In around 1688, he married a woman named Elizabeth, surname unknown. He is buried at the famous Old Granary Burial Ground on Tremont Street in Boston, Massachusetts; burial location of people such as Samuel Adams and John Hancock. 1778 – Born – Jonathan WARNER – Jonathan is my wife’s 5th-great-grandfather on her mother’s side. He was born in Pittsford, Rutland Co., Vermont. He married Anna RIPLEY sometime before 1802. Together they had 7 children. It is unknown when Jonathan passed away.